Yes, you too can own an important piece of absinthe history! 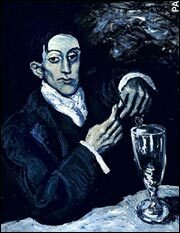 Cough up a measely Â£30 million (only about US$40,000,000) and you can own one of Pablo Picasso's most valuable works, "The Absinthe Drinker". And after a few bottles of absinthe, you'll probably look like the gent in the painting as well. I may be No. 2 in wine and spirits in North America, but I'm No. 1 in Europe, Asia and South America. I was formed when two French firms merged in 1975. My brands include Ballantine's, Chivas Regal, KahlÃºa, Beefeater, Stolichnaya, Jameson, Martell, Glenlivet and Perrier-JouÃ«t. I bought Seagram in 2001 and Allied Domecq in 2005 (selling off Allied's Dunkin' Donuts business). I sell 78 million cases of spirits and 23 million cases of wine each year, raking in more than 3.5 billion euros. 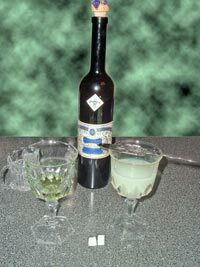 I no longer make absinthe, but my famous Pastis, an anise-flavored liqueur, goes by my name. There's a blog meme going around, especially in the MySpace.com community, called a "Drinking Survey", and question number 22 is "Ever drank absinthe?". It is still, it seems, a "forbidden fruit", probably because it is still illegal here in the United States. One method is to just add all these to a cocktail shaker filled with cracked ice, shake and strain into a chilled cocktail glass. Or you can just swish the absinthe around in the glass, pour it out, and add the bourbon & bitters. Garnish with a lemon twist. Interesting tale from the Modern Drunkard magazine on downing an entire bottle of 100mg thujone (10 times the legal limit) Czech absinthe: Drinking with Van Gogh. 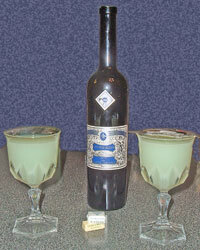 Nice, quickie reviews of six different absinthes can be found on ether-mask's blog. When you hear of an new, privately distilled absinthe being "discovered" in the mountains of Switzerland, you immediately think of some grizzled farmer who cooks up his batch over an old wood stove, feebly stirring his custom mixture. Think again - this one comes from 'distillatrice' Gaudentia Persoz, described as "young, blond and passionate about absinthe". Liqueurs de France tasted it, loved it and is now distributing Persoz's La P'tite brand of absinthe. I have such great friends. I've been wanting to try some of la FÃ©e Verte (The Green Fairy) for quite some time, but never pulled the trigger on ordering a bottle. But my Wednesday night drinking buddy, Michael, recently came back from Paris, and brought us back a bottle of the jade-colored "deadly stimulant" and we transported ourselves back to the Moulin Rouge and the heyday of a bohemian living. We raise a glass of absinthe - oooo. Check the Wikipedia entry on absinthe for a pretty good short history of absinthe, but suffice to say it is illegal in the US to make, buy or transport, but you can own it and drink it, so I wasn't expecting the doors to come crashing in, arresting us on sight! And Michael didn't skimp either. He brought back a bottle of Absinthe Nouvelle-Orleans by TA Breaux, the New Orleans chemist who reverse-engineered the long-forgotten recipe for the Pernod Absinthe. He was featured in a Wired magazine article and a New Yorker profile. It comes in a gorgeous tall thin bottle, with a very pretty label, sealed with wax and a long cork. He also brought over the required absinthe slotted spoon and even a couple of French sugar cubes - we went authentic all the way! After we filled our glasses, we took a sip of the forbidden elixir. And it was surprisingly good, especially for something some have described as "an incredibly nasty drink". Mint, licorice, and other herbs could be tasted. And yes, after a few sips, something weird goes on in the mouth; something tingly, a little numbing, and very much hard to describe. But definitely good, yet something that will require some practice to get right. Colder water, perhaps, with a better ratio. He also brought back another, smaller, bottle, so we'll have to do some taste tests.